Back to routine in good old New England. A grey, rainy early spring day...how beautiful it seemed. Talk with Steve Tarry about an UNO Bear Brook meet, already less than a month away. Already miles to go even as spring is just waking up. Morning walk while still cool. Needed to see where the dhows were kept - also the small catamaran. I'm guessing had I been thinking out of the box, I could have managed a sail on the cat. PM walk in alleys of Stone Town, an eye-opener, esp the fish market. Certainly no training to report these past 2 weeks. This past one was pretty much dedicated to safari and had us in places where “wandering"/jogging/walking in the name of training wasn’t allowed or was unwise. A full-day safari the day before yesterday began at 8:15 and ended at 5:45pm with only one rest stop mid-morning. We had lunch in the car in the shade of a tree and huge boulder outcrop…and discovered two lionesses and 3 cubs within 20’ of us. Clients are understandably not allowed out of vehicles. We saw again & again how lions hid in the grass, often nearby. From Mbuli Mawe tented camp, I wandered some 200m from main parking on the dirt road yesterday morning into lovely countryside - California-like, rolling semi-open, and in this case, with attractive granite outcrops. But I feared going any further. 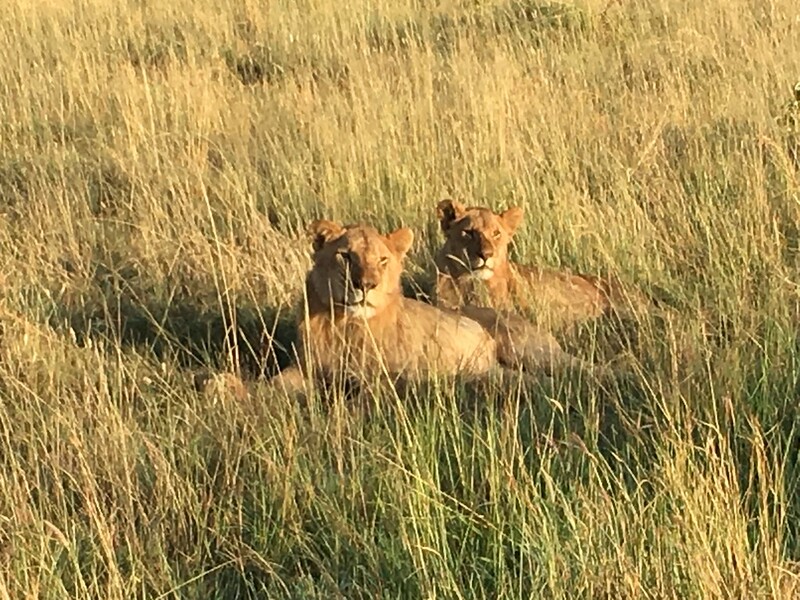 This morning, on the way to the airport, our guide spotted 9 lions right by the roadside. We stopped, not 10’ away from the nearest. Observing the lions, it was as if we and our vehicle weren’t even there - unphased were they. There were the many times when we were just plain tired. There has been a lot of flux, moving on after 1-2 days, not always knowing what to expect etc. And, of course, it’s been hot much the day. The early part of most days has been dedicated to getting ready to go somewhere and the latter part to just relaxing & familiarizing ourselves with the new setting. Also, there’s food…. Always too much. We’ve gotten firm about one serving for both of us but it’s a fight. I don't believe I’ve been so inactive in the face of so much food. And Tanzania is among the poorest of countries.